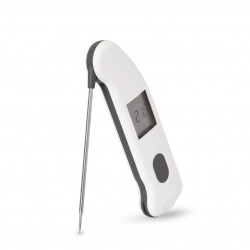 Food borne bacteria usually land on the surface of foods first, so infrared thermometers can be useful for spot checking the holding temperatures of plated foods, serving areas, buffets and warming trays. But infrared thermometers only measure surface temperatures, so they are not very effective at measuring how well cooked food is. Use traditional probe thermometers for this. 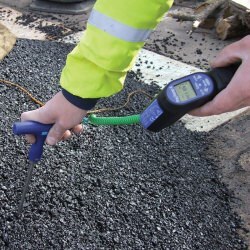 Critical food safety temperatures, like 5°C and 60°C, should always be verified with an internal probe. Fortunately there are three ETI infrared thermometers ideal for this. 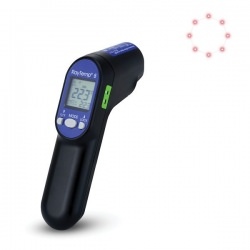 The RayTemp 8 and RayTemp 38 come with attachable type K probes, whilst The Thermapen IR thermometer has an integral foldaway probe to enable internal temperature measurements to be taken. 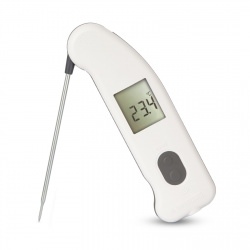 If using an infrared thermometer with liquids like soups and sauces, pull a ladle full of liquid up from the bottom of the pot before taking a measurement to more closely approximate the internal temperature. To measure semi-solids like stuffing, corn or mashed potatoes, insert a spoon into the center of the material, pulling it back to create a void and point your infrared thermometer into the void. Infrared thermometers used to measure temperatures inside a refrigerator or freezer unit should typically be stored inside the fridge or freezer so they are ready to start taking measurements when you need them. To measure the contents of frozen pallets, be sure to break open the pallet, remove at least one box and point your thermometer at the top of one of the center boxes to be sure your reading reflects the temperature of the frozen material inside the pallet and not just the surfaces that are exposed to warmer air. Lastly, be aware that steam, even when a liquid is not boiling, can condense on your thermometer and affect the accuracy of your measurements.